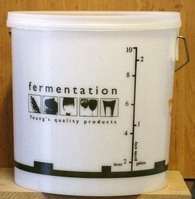 A 5 ltr brewing bin which is ideal for making small batches of beer or wine. A 5ltr brewing bin complete with a lid which is ideal for making small batches of beer or wine. If making wine, the lid can be either be laid loosely on the bin or else it can be drilled and fitted with a suitable airlock. The outside of the brewing bin is marked in both litres, however the graduations are for guidance only and should not be relied upon to be absolutely accurate. Whilst it is also small enough to be used inside a 25 or 33ltr bucket as a floating mash tun when making all grain beer from first principles, care should be taken if using it for this purpose as the handle may well become too hot to hold without an insulated glove. The diameter of our standard 5ltr Youngs bin is approximately 22cm, the overall width (including the handles) is approximately 24cm and the overall height (including the lid) is approximately 20cm.